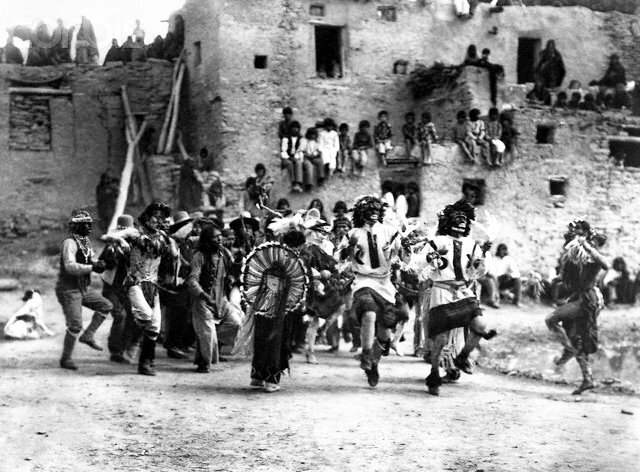 Information: A few years ago at a prestigious gathering of folklorists, one presenter, supposedly a well-educated and respected folklorist, confessed to being terribly frustrated at trying to notate a dance ritual she observed at a Native American Indian ceremony. She was frustrated that, not only did every dancer begin at a different time, some started on the left foot, some started on the right foot, some started with a step, some started with a hop and every dancer started with a different dance figure. It was hours before this poor woman realized that throughout the dance, certain dance "motifs" reappeared constantly, even though they were not choreographed as she thought they should have been  a fine example of how not to conduct research. 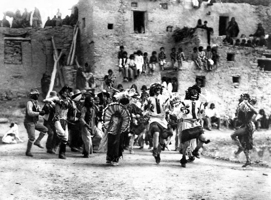 Just as in the study of language or music or any art, the study of dance, particularly ethnic dance with its infinite cultural differences and mandates, must focus on two things: first, the role of the dance in the life style of the people and second, the building blocks of the dance  the "dance motif." The folk dances of Europe  and almost everywhere else  are the social dances of their people, just as the fox trot is to Americans. They are in reality, "social dances," and to consider them otherwise is a blatant exercise in ethnocentrism. If we continue to view the dance as a curious, charming, even fascinating and compelling hobby, we will never realize its true significance and our practice of the dance will continue to be a shallow one. Let's consider the concept of the dance "motif." In those cultures where the couple dance form is predominant, it means that each couple is a "dance unit" within itself, uncontrolled by other "dance units" and are free to perform any variation it chooses. Just as in the Fox trot, the dancers must perform within a well-defined repertoire of dance motifs. This collection of motifs makes up the building blocks of the dance with which the dancers create the dance. That collection must exist or the dance will not survive; think of all the dances that the fox trot and waltz and polka, with their well-developed motif structure, have outlasted. the ways in which partners counterbalance each other. Needless to say, there are countless others. Does the couple remain in closed position or do they change to an open or semi-open position? How close are they? How free is the woman to exercise her own variations? Are the movements long and graceful or compact and controlled? Is the tempo quick and energetic or slow and languorous? Is the motif completed in two counts? Three? Four? Is there a combination of slow and quick beats? Chain dances of the Balkans  and elsewhere  share the same motif structure, though generally limited to step figures, since the arms are occupied with contact to the person on either side. This simplifies the identification of dance motifs considerably. We need only to determine the number of beats between repeats of a figure and add on the character of the dance movement. The wide variety of musical rhythms, from 2/4 to 13/16 and beyond, and the frequent misalignment of dance and musical phrasing, can lead to a fascinating and challenging task. Different folk dance cultures move with different characteristics, even within the same country. In Bulgaria, for instance, the earthy movements of Dobrudža contrast sharply with the electric excitement of Šop dance. The high-flying jota of eastern Spain differs markedly from the earthy, sensuous sevillanas of Andalusia in southern Spain. The lightly-stepped kolo of Serbia contrasts with the vibrant, earthy drmeš of Croatia. The point of all this is to illustrate the motifs of the dance are like the brush strokes of a painting. Just as a Van Gogh differs from a Monet, the dances of one culture, even within the same culture, differ from another. It is only by looking "into" the dance to see its brush strokes that we can truly appreciate this most passionate of the folk arts.